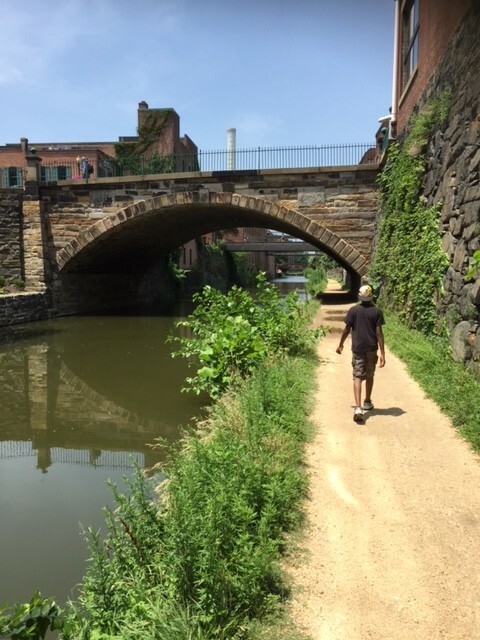 Walking along the Chesapeake and Ohio Canal in Georgetown. The summer is in full swing, which means it’s prime season for family travel and for us, that means a DC staycation in family-friendly accommodations. Every year we make it a point to do a staycation because there’s so much we have yet to discover in our backyard. Neither one of us are natives, so although we’ve lived in the DC metro area for over 10 years, we’re still exploring. 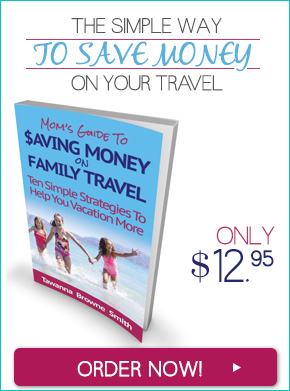 With all the things todo in DC it’s usually our #1 choice for a local family getaway. One of the biggest challenges with our DC staycations is finding a proper family friendly hotel. As you can probably guess, hotels in DC vary in price and style. We like to stay in a place that offers the amenities we need and is centrally located to the things we want to do. 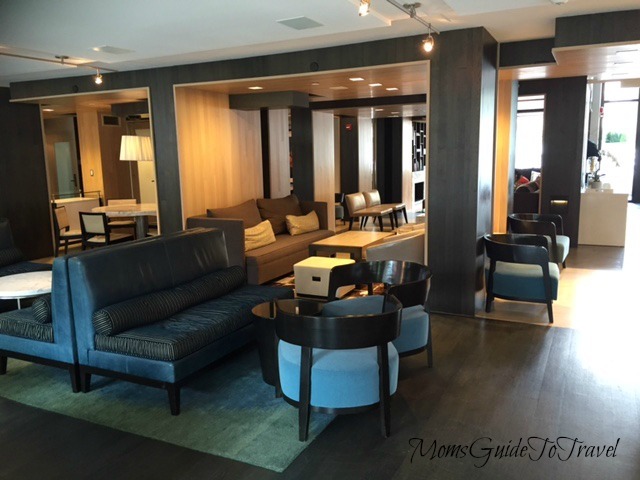 Our Father’s Day weekend getaway brought us to the Avenue Suites DC, a Modus hotel. Although neither one of us was familiar with the Avenue Suites, we quickly learned that it was a popular choice for other families as well. Rated #5 on Trip Advisor for DC hotels, we ran into several international guests and families. At one point when we walked through the library, I felt like I was in a European hotel. 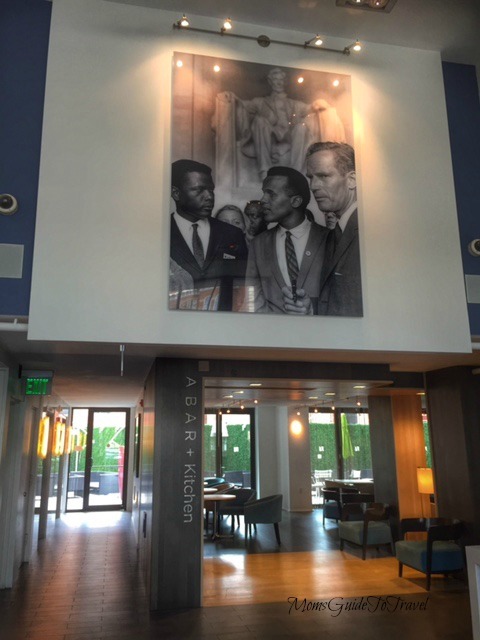 Aside from the various accents, the hotel’s modern decor with its simple decor and iconic photographs through the hallways and along the walls, “trick” you into thinking that you’re somewhere other than DC. We stayed in a premium two-room suite on the 10th floor with a view that faced Pennsylvania Avenue. The kids enjoyed the extra space just as much as we did. I had to drag my 11-year old out of the bedroom where he sprawled himself out choosing to watch TV “and relax” over exploring Georgetown. Meanwhile in the living room, my husband made himself comfortable on the couch as he caught up with the latest sports news. My 7-year old bounced between the living room and the kitchen, high off of a chocolate chip ice-cream cookie sandwich from local vendor and Avenue Suites partner Captain Cookie and the Milkman. 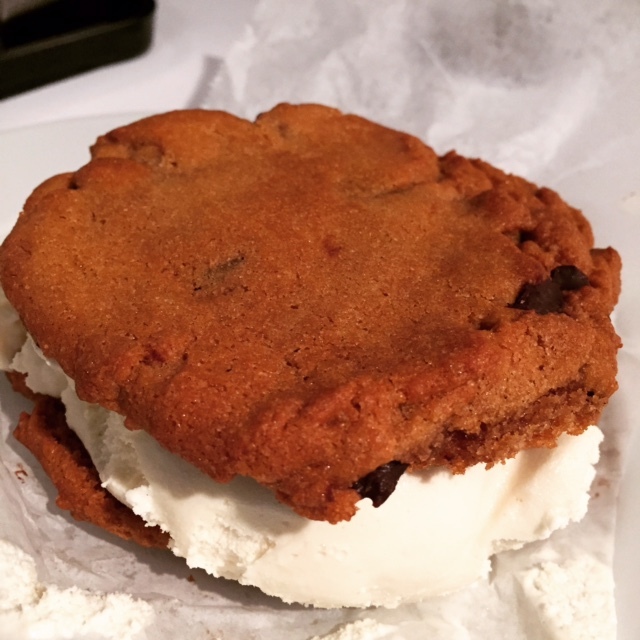 I couldn’t blame him for it – the hand-made chocolate chip cookie sandwiches were addictive and out of this world. 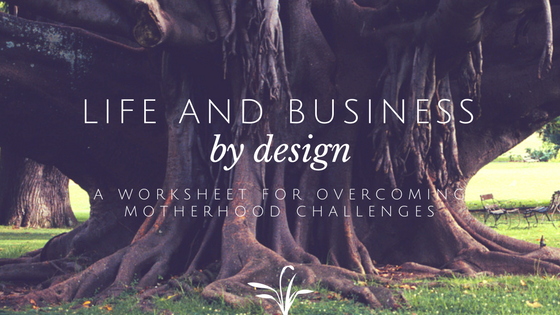 The best characteristics about our room were the overall space and the full kitchen. My 11-year old enjoyed his time in bed. I thought the bed was average and that the bathroom could use some modernization. The overall decor of the room was tastefully done: simple, modern and comfortable. Every hotel should offer a program like this for their family travelers. Talk about a convenience ahead of your arrival. I was able to order from a list of basic Trader Joe offering, just enough to satiate us ahead of hours of exploring. Trader Joe’s being just across the street, anything else I needed (like wine) was a 5-minute walk away. The Stock-The-Fridge program had a minimum purchase of $25 ahead of taxes and a nominal delivery fee. I chose for us: fruit, popcorn, pretzels, water and lemonade. However, you could also stock the fridge with salad, pizza, and other quick-eat items. My boys headed straight for the ice cream sandwiches within 10 minutes of being in the suite. When no one was looking, I quietly enjoyed mine as well. It’s been a few weeks and I can’t stop thinking about it. It’s certainly the best I’ve ever had. I paid for my food sins the next morning at the 9a.m. outdoor yoga class. Although it rained on our parade. 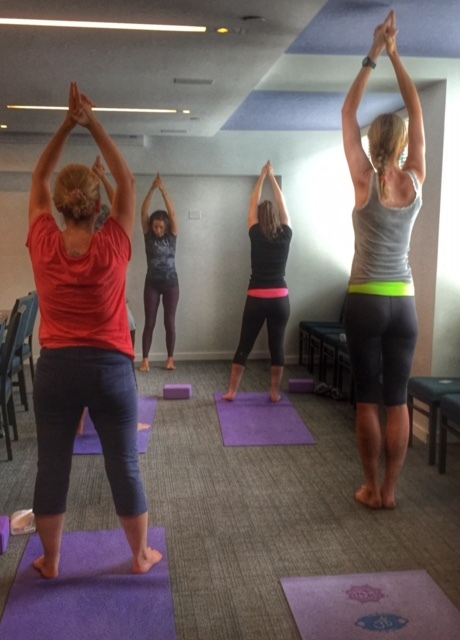 We moved our Namaste into a conference room and still had a relaxing morning experience. 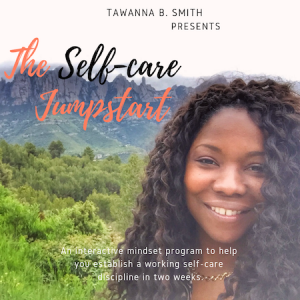 Our class of 8 stretched and meditated for an hour under the instruction of a Georgetown Yoga teacher – a free treat for our bodies, minds and souls. The single working elevator and the lack of a pool were a challenge. Eventually the elevator will be in order but summer is a rough time to deal with the inconvenience in a hotel filled with families like your own. It was the #1 complaint I heard from hotel guests as we waited to go up to our room. The lack of a pool is an entirely different story and a missing amenity that we were only able to deal with by spending as much time as we could exploring Georgetown. Pools are important to our kids and tend to be the highlight of their hotel stays. We do our best to oblige by choosing a property that offers one. 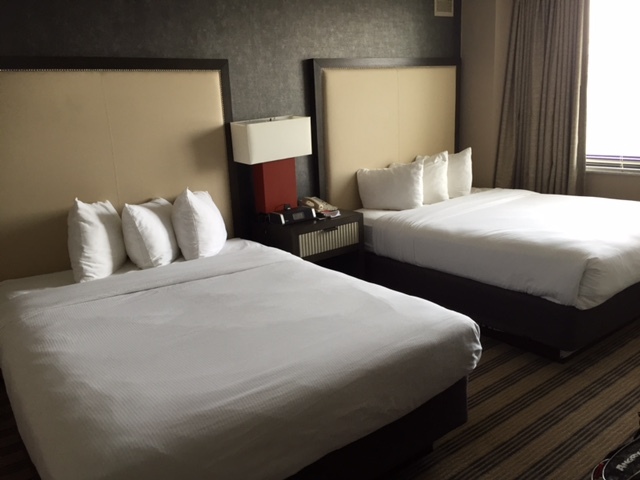 Overall, I’m a fan of the Avenue Suites DC for a one-night family staycation in the Capital. My babies are swimmers so I couldn’t stay for too long. It’s important to know what kind of travelers everyone in your family is and what makes them happy when they’re on a getaway. 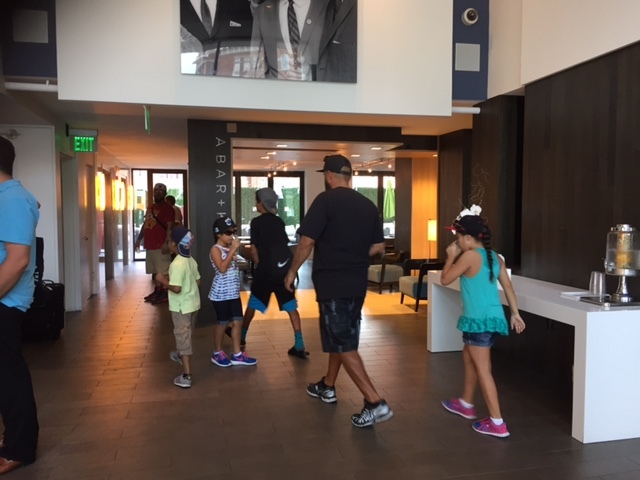 Gratefully our large suite, our stocked kitchen, the friendly staff, central location, and those delicious chocolate chip ice cream cookie sandwiches offset what was missing and kept the family smiling for the weekend. 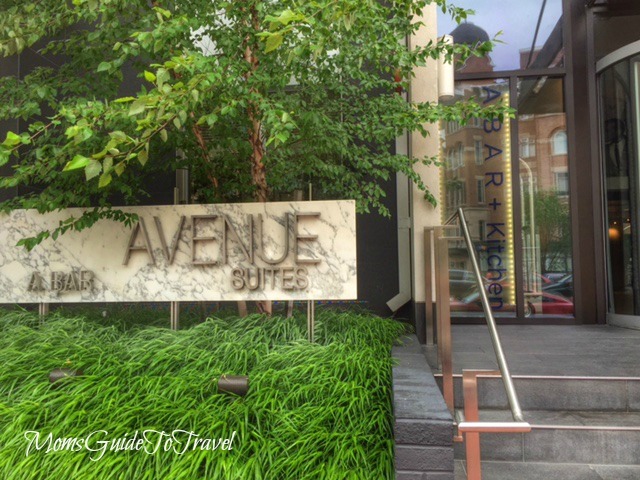 We were guests of the Avenue Suites DC who hosted one day of our weekend stay. All opinions expressed are my own.